One is the Unfinish Object (UFO) 1930's DuBarry dress that you've all managed to get me really excited about again! 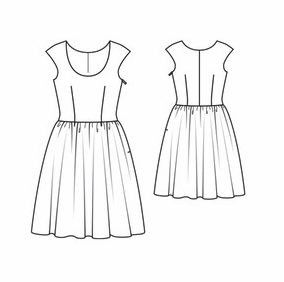 This week's challenge is two-fold: To make our own aprons pop, we'll also be making this BurdaStyle dress in black. Now, I gotta get cooking on this! What are you working on this week? Oh yay! I'm excited to see your what your 40s pattern is like...you know how I love a cute apron! I *love* that Burda dress. It's from the January Burda, right? I almost bought the magazine just for that dress, but I believe it's been recently added as a print at home on the Burda site. Have fun with your apron! I've made that Burda dress in raspberry red and it's my favourite dress at the moment! I've got two more on the go! Sorry I am late for congratulating you for the Eva Dress contest. You deserve it!!!! I love your photo stream of the black suit, it is so classy and Edimbourgh is a fantastic setting. I spent a year over there in 1984 and that's why reading your blog is so dear to my heart. I heart Edimbourgh and love l'ÉCOSSE. This Burda dress is on my endless sewing list. At the moment I am sewing a pea jacket for DS with some tailoring that gives me headaches. It's on my blog. Debi, how neat! I am really interested in seeing how your apron turns out. :D Love seeing all your projects. Yeah! I also am in love with that dress Burda, it's on my list of projects. Good that you picked up the dress Dubarry, I'll be looking forward to your projects. the Burda dress looks lovely, I will take a closer look. This week I am starting a basic looking shirt dress. I also want to make some place mats ready for easter! Oh, yay! The DuBarry dress! I am excited to see your apron & dress combination. I really like that dress pattern. cute fabric! i'm excited to see how the apron turns out. i've been meaning to make one myself. I have two more BBQ aprons to work on for a motorcycle event this weekend for my hubby and two of his fellow riders. I've had to adjust each apron two fit the guys, them all being a different height and, um, width. Sadly their not vintage aprons but I'll be whipping one up for myself! Love the burdastyle dress. It's certainly on my to-do list! Ooh! Looking forward to the polka dot apron in particular. Sounds like fun. This week I'll be working on a casual 50s sleeveless blouse in some fabric I don't really care for (a poly/cotton blend that is way more on the poly end than the cotton end, which I didn't know until it arrived). But on the bright side it's the exact shade of red I need to match a pair of capris I recently acquired, so at least it will get put to good use!